The pace of home sales rose sharply in June but was still below the pace of sales in June 2013. Prices posted moderate gains in June as well, remaining on pace with the year-over-year growth seen last month and keeping home prices growing at a sustainable pace. The rise in inventory slowed from the previous month, leading months of supply to tighten slightly due to the pickup in sales. Rates have continued to remain flat for the first half of this year, and buyers should be looking to take advantage. 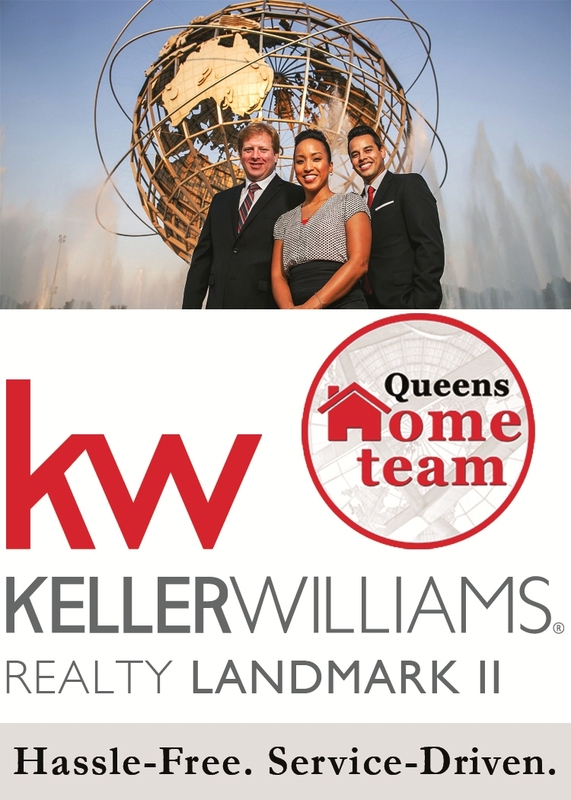 With home prices posting slower but solid year-over-year gains, those looking to sell should also be well positioned with recent equity gains in most markets of Queens. 30-year rates rose a mere 3 basis points from the same week of the previous month, continuing this year’s streak of relatively flat and occasionally falling mortgage rates. 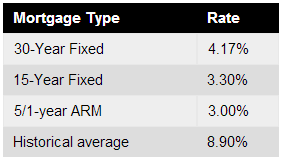 Currently, Freddie Mac reports the following figures: 30-year fixed rate, 4.17%; 15-year fixed rate, 3.30%; 5/1-year adjustable rate, 3.00%. The seasonally adjusted annual pace of home sales increased 10% from May to June, to 722 homes. This is still 8.8% below the pace at this time last year, which in combination with higher levels of inventory has helped keep prices rising at a more sustainable pace than we saw the previous year. The pickup in home sales in June is further evidence that the market is recovering after the slow first quarter of 2014. Residential and Condo home sales are down year-over-year, while Coop sales are up from this time last year. According to the Long Island Board of Realtors, the median home price was $372,900 in June. This is an increase of .8% from the previous month and a decrease of 3.1% from the previous year, when prices were $385,000. Year-over-year price gains have slowed in recent months due to higher levels of inventory and a slower pace of home sales than those in the previous year. This moderation in price should help keep affordability more stable in the near term. Average Home price in Queens was $422,756. 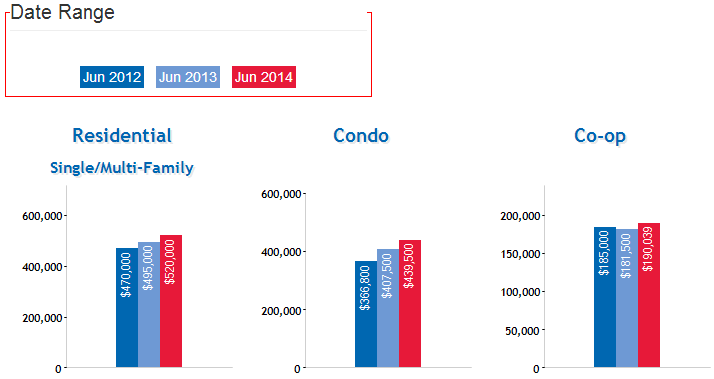 Median price for residential homes, condos, and coops are all up year-over-year. 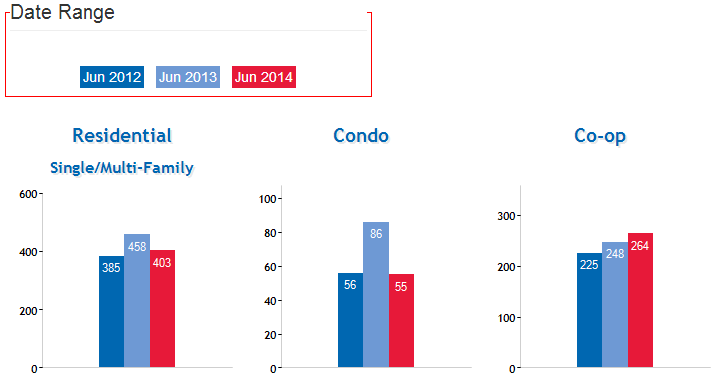 Average sale prices for residential homes and coops are up, while condo average is the same as last year. The number of homes available for sale decreased by .9% in June to 5,760 homes, which translates to 8.75 months of supply. Despite the decrease in availability, the months of supply increased from the previous month, as the increase in available homes did not keep pace with the rise in the pace of home sales. In the same month of last year there was 9.3 months of supply, meaning that buyers will have less options available this summer compared to the same time last year.